Where to Buy Cutrine Plus, Cutrine Plus Algaecide Herbicide - 1 Gal - $34.78 for Sale with Fast Free Shipping! 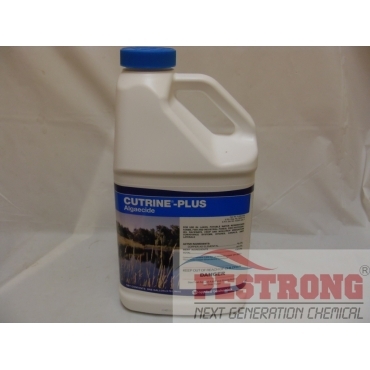 Cutrine Plus Algaecide Herbicide - 1 Gal is ideal for planktonic and filamentous algae, chara and hydrilla. Sonar AS Herbicide Aquatic Fluridone - Pt -..
Mirage Blue WSB Lake and Pond Colorant 4 x..
Algae are small organisms which spread rapidly through flowing water, wind or on living organisms. Once in a pond, algae can cause cloudy water, a scum on the water surface, and/or thick mats that may be both underwater and floating on the water’s surface. Applied Biochemists offers a variety of algaecides which vary in type of algae controlled, active ingredient, use sites, formulation, application rate, water use restrictions, dilution requirements, permit requirements and product registration and availability. Application rates range from 0.6 to 3 gallons per acre foot of water treated. Active ingredient is 9.0% copper as elemental (copper-ethanolamine). Product must be diluted prior to use. Cutrine-Plus Algaecide Herbicide - 1 Gal is for large bodies of water and cannot be used in small ponds containing koi or gold fish. If you want use in small ponds containing koi, use GreenCleen Pro Algaecide Fungicide. I used this for kill algae on pond. this works great!